When there’s mold present, no one is happy. You’re not happy. Your family isn’t happy. Your guests aren’t happy. Everyone (except for the mold spores, of course) is pretty unhappy. Mold is far from pretty and it can make your home look and feel very uncomfortable. Not to mention, it can make people very sick when they are exposed to it. And now, you might be trying to figure out a way to get rid of this unsightly visitor. When there is mold on the walls, one of the solution a lot of people consider is paint. That’s right. Painting over mold is actually a common solution to mold growth, especially when it’s growing on a wall or ceiling. It seems like a quick fix, one that will eliminate the problem. But, if you’ve been thinking about using this method to get rid of the nasty appearance of mold in your home, let us help! Okay, here’s the deal. In just a few weeks, your family will be coming over for a birthday party. Or your friend will be spending the weekend at your home. Or, maybe your mother-in-law is coming to visit for a few hours. You’ve been busy preparing for your visitors. And you are excited to host them in your home. You and your family are rushing to make sure that your home is clean and ready for company. But, you have recently discovered a little problem. Actually, you’ve found a major issue. There’s mold in your house. And, if you have mold growing on your walls or ceiling, your mission is probably to get rid of that stuff ASAP. It’s ugly and sickening, literally. So, you want to figure out a way to take care of the problem, and fast! But, maybe you just aren’t sure exactly how to do that. There are a lot of things you can do to take away the eyesore we call “mold”. You can use household cleaning products to kill the surface mold. And you can work to eliminate any unpleasant odor that might be coming from the mold growing in your home. There are some other options some people have considered when it comes to mold clean-up. Many times, people who are trying to fix a mold issue seek to get rid of the problem by covering it up. Maybe that’s the approach you were thinking of taking. Your mind is tempting you to search for the best way to hide the less-than-beautiful substance growing on your wall. Your fingers are on the verge of typing “can you paint over mold” in your search engine. You’re at your wit’s end. And, this seems to be the best way to quickly solve the problem. Right? We’ve got three words for you: don’t do it. Seriously, don’t do it! Painting over mold may sound like a great idea in theory. After all, one of the main reasons you want to get rid of mold is because it’s ugly. Even if you and your family don’t feel any mold exposure symptoms, you want the mold to be gone because it doesn’t look good. So, paint seems like an obvious answer, right. It will cover up the ugliness of the moldy walls, presenting you and your guests an acceptable appearance. That’s all you really need, isn’t it? Nope! That’s because, whether you cover it with 5 coats of paint or leave the greenish, blackish growth out there for the world to see, the mold is there. In other words, you haven’t actually solved the problem. Painting over mold doesn’t get rid of the mold; it only covers it. See, even if you don’t think anyone is getting sick because of the presence of mold, this growth could still be impacting everyone who is exposed to it. You might not feel the effects immediately. But, over time, you could experience illness because of the mold in your home. Your children or pets could eventually show signs of mold-causing sickness. In addition to possible illness, you may also find that painting over mold is only a temporary fix. Mold is alive and will continue to cause problems as long as it is living in your home. You won’t be able to stop it or kill it with a paintbrush. Actually, you might spread the spores by rubbing your paintbrush across them. Also, you can be sure the mold will eventually eat right through the paint. It could also cause discoloration in the walls and make the paint chip and crack. Alright, so, we’ve debunked your last resort. You’ve tried killing the mold with bleach and other household products. You’ve scrubbed and scrubbed and scrubbed some more. But the mold never seemed to disappear. So, you decided to try painting over mold growth in your home. And now, we’ve told you that it’s not such a great idea and it could do more harm than good. You’re probably thinking, “Now what?” Don’t worry; we’ve got a solution for you! Many companies assure you that mold removal and repair are possible and can completely rid you of mold in your home. Sounds like a good option, right? After all, you want to get rid of mold in your home and prevent it from making you and your loved ones ill. And, it would definitely be great to make your walls and ceiling look nice again, free from the nastiness of mold. Well, the truth is that there is nothing that can completely remove mold. Mold spores are always present. And you will not really be able to stop them from floating and drifting throughout your home. Bummer, we know. But, there is some good news! We’ve got one word for you: remediation. (Well, make that two words: mold remediation.) Although no one can actually erase the presence of mold spores, it is definitely possible to stop mold growth from taking over your home. By now, you are probably wondering what other option there is. If you are not supposed to paint over the mold in your home and a mold removal and repair service can’t really help you to completely remove the mold spores, what else is there to do? Is there anything else you can do about the indoor fungal invaders in your house? The spot on your wall is still there and you need to get rid of it right away. So, what should you do? Let A Plus Mold Remediation Inc. Help You! Here at A Plus Mold Remediation Inc., we specialize in mold testing, mold remediation, and many other services concerning mold growth. We work to help our clients to get rid of their mold problem, once and for all. We understand that mold spores are always present. But we make it our mission to make sure our clients are safe from the negative and harmful effects of excessive and dangerous mold spore levels. Our team is aware of the conditions that encourage mold growth. And we are also aware of what it takes to prevent further growth. Our goal is to make sure your home is safe and completely free from the unhealthy effects of high mold spore levels. So, if you have a mold problem in your home, it is best to avoid painting over it or using household products to kill the surface mold. Although these options help to cover or get rid of the visible signs of mold in your home, they are only temporary fixes. After a while, the signs of indoor mold will likely return. It is far better to have professionals deal with the problem. This way, you can be sure that you and your family members are not going to be affected by the presence of mold any longer. You can rest assured that you all are safe and sound, protected from the harmful impact of indoor mold. And you can save time and money by letting the pros handle the problem from the get-go. At A Plus Mold Remediation Inc., we handle your mold problems so that you don’t have to. There’s no need to worry about indoor mold growth anymore. If you need help treating and dealing with a mold problem, just give us a call today! Let us take care of all of your mold remediation needs! **Originally posted on February 6, 2019. Updated on March 26, 2019. 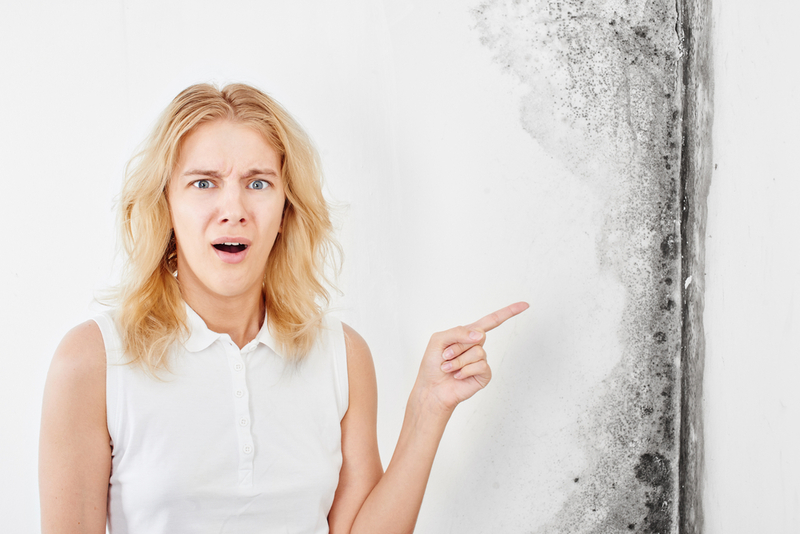 ← Why Is There Mold Growing on Walls in My House?